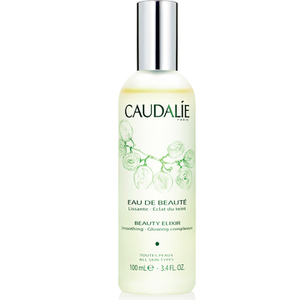 Caudalie Moisturizing Toner gently removes make up from your pores, as well as intensely hydrating your skin. As well as nourishing your skin, it also boosts the effectiveness of your overall skin care regime, so you see better results all round. Enriched with Vinolevure, Caudalie's exclusive ingredient that's extracted from wine yeast, it brightens your complexion to leave your skin looking more radiant and youthful, whilst the fresh scent of citrus flower, orange tree leaves, watermelon and crushed mint will awaken your senses. Aqua (Water), Butylene Glycol, Peg-40 Hydrogenated Castor Oil*, Methylpropanediol, Sodium Benzoate, Parfum (Fragrance), Caprylyl Glycol, Sodium Carboxymethyl Beta-Glucan, Citric Acid*, Glycerin*, Biosaccharide Gum-1, Phenylpropanol, Glyceryl Caprylate*. Receive a FREE Caudalie Hydration Essentials when you spend £50 or more on Caudalie. It smells good and I like it very much! The price is amazing! I can't keep myself from shopping from HQhair.